I have observed that most parents get super hyper when it comes to traveling with babies and kids especially on an international flight! If you plan it well, then it can really be managed and you no longer have to wait for them to grow up before you can continue exploring your passion for travel. 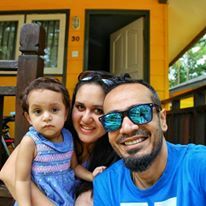 I don’t take any guarantee but I can surely say this – with a little planning ahead you can absolutely have a wonderful family time on an international trip! Many of you have also asked me on how I managed an international flight with a baby? So today am sharing our experience and as a result, some tips to fly with babies. We took our first International trip to Bintan Islands in Indonesia in August 2016 and Kenisha was then just 15 months old. She was still crawling on her knees and we knew we had to carry her around in our arms if we have to hop over from one place to the other. 1. Baby on Board – Firstly check the flight details and check their website on the allowance for baby luggage. Ideally, you will be paying less for babies under 2. Most international flights allow easy to fold strollers. But do read up about your destination and if its stroller friendly? Else you will be carrying a useless piece of equipment. Next – Ensure it’s tagged correctly! Ours went missing in a connecting flight! Luckily I was carrying an Ergonomic carrier by Kol Kol Carriers that helped! 3. For the Rainy day – Put enough in your carry-on bags for the first day or 2 of your trip. We had a nightmare when we found out that one of our suitcase (carrying baby and my clothes) went missing. I had exactly 8 diapers left and one t-shirt for the baby. We struggled hard and luckily our suitcase came in the next connecting flight and was handed over to us the same night! Phew. Lesson learned. 4. Pick the right seat – Ask for a baby-friendly seat. If you are a breastfeeding Mom like me you can do with some privacy at a window seat or also take a seat in last few rows to access the toilet for regular diaper changes without bothering anyone. It’s also a great spot to pick up a crying baby and try to calm them down without disturbing too many passengers. 5. Check in early – This one goes without saying. Don’t follow the mom standard time. Calculate 1.5 hours extra and check-in. It can help with sudden bouts of sleep regressions, unexpected diaper explosions, and more such issues. Make you of the early boarding calls especially for travelers with kids. Get in quickly; stack up your luggage with easy access for later use. Plan your spot and then sit and relax. 6. Keep the Meds handy – Now with a baby ensure you carry a copy of his / her vaccination card plus any other test reports you may think is needful. Have all your OTC medicines ready especially common cold cough and fever. I prefer to make a list of medicines and prescribed dosage after consulting without pediatrician. This should be in your baby bag and always in your reach. 7. Stuff up some yummy Food – Since Miss K was still breastfeeding it was the perfect way to help with takeoffs and landing. In case of formula, always carry an extra pack and a bottle in case you lose one. Apart from that arm yourself with plenty of travel-friendly snacks. I picked small packs of flavored yogurts and kept simple fruits!! It is worth bringing a few candies or lollipops to help with the pressure change during taking off and landing). Some child-friendly cookies from Slurrpfarm would be my next bet for the upcoming travel! 8. Check for the kids’ play area – Long flight at odd hours cannot always be avoided during international travel. Our Flight to KL was at 12 am. So to keep K busy we found a small yet super awesome play area at the Delhi International Airport. She had not yet started walking independently then but she was very enthusiastic to walk holding my hand or with support and enjoy all the rides! She crawled all over the place and it helped to tire her down! No points guessing that she slept through the 6-hour flight! 10. Entertainment makes it fun – In-flight, entertainment can come to a rescue but just in case your kid is not in a mood, make sure you are equipped to handle a bored and restrained tod! Especially with babies it’s tough to contain them in a limited space. More than real toys, mine is happier with stickers, tapes or just random catalogs on flights as she loves books. Keep small yet simple toys and hand them over one at a time only to keep it exciting. If there is a favourite toy, don’t forget to carry 2nd favorite for the return in case it’s lost. These ideas did work for us and we are still learning with every trip we make with our little girl. I will be very excited to hear about your travel stories and how you worked on ideas for your baby? The yummy food is the most handy in my ammunation. Great post. I have travels coming up and with two kids in tow, this should ease it out. Awesome tips! I always used to throw in some colours and drawing book, once they learnt to hold pencil! Those are some amazing useful tips listed there !! I agree to all the points. Traveling with a toddler means you carrying the whole house with you, whether you travel by air or on road. your tips are really handy and much needed for stress free travel …each and every point is important ..
Thats a long haul and so glad to hear that lil Kenny sailed through. Food & entertainment most important while travelling to keep the kid busy. Yes especially with toddlers whoa re super active! This are some wonderful tips which will make traveling with toddler a little easier. Thank you for sharing this. Hahahah! True! While travelling I make sure to carry extra tshirt for myself along with my toddler’s stuff! Traveling for 24 hours with a kid, you did an amazing job 😍 Going to bookmark your post.